Inducted 2007. Long-Time Contributor to Football, ACES Basketball Teams. Had Dale Venvertloh’s only contribution to QND’s athletic programs been having four talented sons play for the blue and gold, he would have still made quite an unforgettable impression at 10th and Jackson. But those who have been close to the school’s athletic teams know his efforts and involvement were much greater and will have a much longer impact. Venvertloh has been the president of the football committee since 1992. He has helped with the financing and organization of renovating the weight room in 1992 and again in 1999. He had a big part in the construction of the press box and bleachers for the football complex, as well as grading and planting of the practice facility and installing an irrigation system. 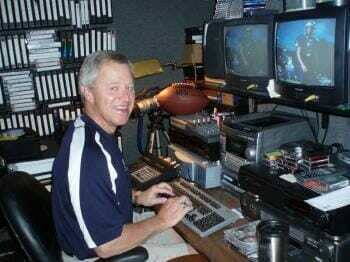 He has organized spring and fall football trips, and he has videotaped nearly every game he has attended. Possibly his most memorable contribution to the players and their families over the years was the annual highlight tapes he created with his own videos and local news highlights. Venvertloh also helped in 1990 to create the ACES boys basketball traveling program for boys in grades 5-8 in Quincy’s Catholic schools. He helped recruit coaches for teams, raised money for tournaments and uniforms, organized practices and locations and continues helping the program to this day. He also served as a coach, working in the CYO and YMCA programs and even as a quarterbacks coach with the varsity football team. Venvertloh and his wife, Marty, are the parents of four boys — Scott, Craig, Kyle and D.J. He has practiced law at the Dale J. Venverltoh Law Offices in Quincy for more than 25 years. To be selected to the Quincy Notre Dame Hall of Fame is a very meaningful honor that I accept with tremendous gratitude. I must give special thanks to my wife, Marty, for her love and support, and to my four sons, Scott, Craig, Kyle, and D.J., for all the thrills and inspiration they and their teammates provided. I am also extremely grateful for the close relationship my family and other families have shared with Bill Connell, Scott Douglas and their coaching staffs, and for all the work done by past and current members of the Football Committee in the development of the football program and the athletic complex. The recognition of any contribution I may have made to QND also requires the recognition of one other simple truth … I am but one among many. I would be remiss if I did not accept this honor on behalf of all QND families through the years, all of whose continuing efforts and involvement have made the school such a special place. My contribution has been a labor of love. As honored as I am to receive this award, I would trade it for one thing … the chance to do it all over again.